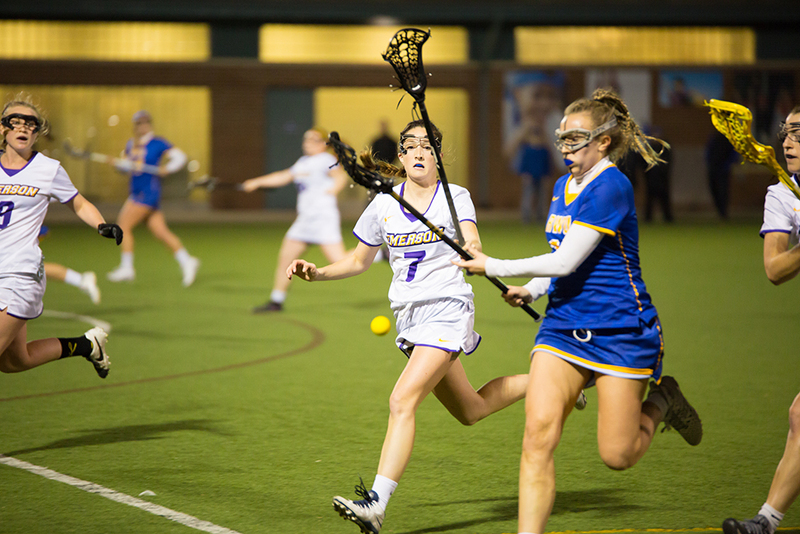 Emerson's women's lacrosse team kicked off its season with a 12-11 loss last night. Goalkeeper Kristina Modica made a save. The Emerson women’s lacrosse team is heading to Colorado over spring break to prepare for another playoff-bound season. They finished last year with a loss to Springfield in the NEWMAC semi-finals, and are predicted to once again place fifth in the standings, according to the 2017 coaches’ poll. Head Coach Kat Egizi is looking to expand on the team’s success last year—when they made the playoffs for the first time. “We want to not only match that but to go a little further in the NEWMAC and continue to prove that we are a contender within the conference,” Egizi said. This will be Egizi’s third year coaching the team, with 2016 Emerson graduate and lacrosse player Kate Lemire serving as an assistant. The NEWMAC competition is looking to be more difficult this year than any years prior, with teams such as Springfield and Wellesley adding multiple transfers and recruits to their rosters, Egizi said. According to her predictions, most of the teams in the conference will be equally competitive with the Lions, and winning close games will most likely be the key to success this season. “We don’t really have any ‘gimme games’ as I call them, as far as easy wins, so we’re not necessarily looking to go undefeated,” Egizi said. Emerson lost last year to Wellesley, 10-6. This year, because the teams are equally matched, the game against Wellesley is a must-win.Team captains Meredith Weber, Christine Davies, and Kristina Modica stressed the importance of this win in terms of making the playoffs. Fresh talent will be something to watch for, with five freshmen playing in their first season at Emerson, and two transfer students joining the team. Weber said she could see all of the new talent playing a large role this season. The roster has grown with the addition of seven players, providing the team with more versatility. The team is hoping to continue working with Egizi’s “free flowing” style of play. This style of play allows players to leave their designated spots on the field to cover other areas if needed. Egizi emphasized the importance of the ability to read situations. Egizi said it’s important for new players to learn to connect on the field before the season starts. The team is looking forward to getting out of Boston and into the mountains of Colorado for spring break training. They will be scrimmaging against Colorado College and Pennsylvania’s Ursinus College at the Colorado College fields in Colorado Springs. They’ll also be focusing on getting to know each other better, on and off the field. Davies said Colorado is for watching film and practicing without having to focus on classes. Preseason practices have been carrying on smoothly, with the exception of the loss of practice time due to a leak in the Bobbi Brown and Steven Plofker Gym. The team played its first game against Roger Williams last night with a close loss, 12-11. Egizi hopes to locate the team’s weaker areas early to improve over spring break. To interact with fans, the team has created their very own Instagram “@emersonwlax,” where players are given access to the account each week for #TakeoverTuesday, updating social media on their lacrosse-related schedules. The account was the idea of Lemire and has 208 followers. Modica said the account is a unique way to interact with coaches over social media. The team hopes to improve throughout the season to prepare for their final conference game against Springfield College on April 26. Weber said that, despite a loss to Springfield in last season’s playoffs, the Lions consider themselves even competition.